Tête de Moine AOP, Bellelay cheese is a first-class product crafted in small cheese dairies according to traditional methods which have to comply with the requirements of the AOP specifications. From spring through to autumn dairy cattle graze in the Swiss Jura’s mountain pastures where they feast on spicy grasses and herbs. In the winter months, the cows are fed on fragrant hay cut from the same rolling meadows. The grasses and herbs that grow so abundantly in the unspoilt landscape are what gives Tête de Moine its distinctive character and unique taste. It was in this setting, in the Bellelay Monastery, that this cheese specialty was first created 800&npsp;years ago. In order to preserve the ancient and traditional method of cheese production, Tête de Moine, Bellelay cheese, is registered as a protected designation of origin (PDO, AOP in french). This is your guarantee that the Tête de Moine you purchased is the genuine article. Each Tête de Moine is a cylinder-shaped, semi-hard cheese weighing around 800 g on average. It is produced from natural, untreated milk from mountain cattle that are never fed on silage. 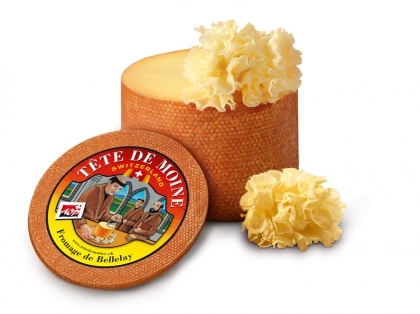 Tête de Moine is produced in village dairies in the area of origin in accordance with the stringent protection of designation of origin specifications. The cheese develops its unique aroma as it ripens on boards made from fir wood. Cheese must pass strict quality test before being allowed to use the name Tête de Moine PDO, Bellelay cheese. Tête de Moine is not cut but pared with a special device called a Girolle with which the delicate rosettes are created. Experts are also able to pare the cheese with a knife blade held upright. The wafer-thin rosettes allow the full flavour of the cheese to develop, which heightens the tasting pleasure. Tête de Moine is best stored in the fridge under a cheese cover to maintain its humidity. This preserves both its robust aroma and texture and ensures that the cheese is ready for paring at any time. Tête de Moine should be pared straight from the fridge so that its consistency is just right for scraping the delicate rosettes. Cheese connoisseurs give Tête de Moine rosettes pride of place on their cheese boards and once tasted, it’s certain you will too. A true gift of nature, Tête de Moine should be savoured as a starter with an aperitif, as a dessert cheese or a gourmet snack. A Tête de Moine and Girolle make an attractive and much coveted present.